Interesting note. Though this article from the Ventura County Star and others like it note that fourteen different Springfields are currently vying to be the one that hosts the premiere of The Simpsons Movie, Wikipedia states that the United States has exactly 34 states containing a place named "Springfield." That's including the West Springfields and North Springfields and the like, as well as Springfield Townships. As for modifier-free Springfields, there's twenty-three. (In Illinois, Massachusetts, Missouri, Ohio, Oregon, Colorado, Florida, Georgia, Kentucky, Louisiana, Maine, Michigan, Minnesota, Nebraska, New Hampshire, New York, South Carolina, South Dakota, Tennessee, Vermont, Virginia, West Virginia and Wisconsin, to be specific.) And there's another three in Canada, even. 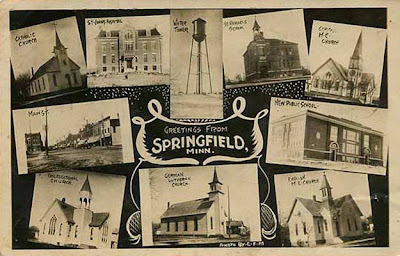 This website showcases the various American Springfields as represented by old-timey postcards, and I like that.